The patio pots tucked away at the south end of the house transport us to far flung places. Thanks to the steps leading down to the pergola shrouded in vines, the display to the right hand side is concealed from view until the last minute. The ‘reveal’ is a surprise. In June the three groups of pots clustered either side of a wooden bench and the steps to the sitting room look generously spaced. By September the planting burgeons in all directions leaving just enough room to sashay along the path. On Sunday morning the sun shone, the temperature gauge on the wall soared and the colours sizzled. The display is a simple repetition of a few key plants. They have exotic looking foliage and yet are vigorous plants that are easy to grow : Canna ‘Tropicanna’, Arundo donax versicolour, and Phormium ‘Evening Glow’. After several years, variegated Arundo donax towers to reach the wisteria. The Mediterranean giant reed is a remarkable plant capable of making this much growth in just one season, like bamboos the new year’s growth is taller year on year until it reaches maturity. The plain green form is hardy and ground grown makes a dramatic stand in a neighbour’s garden. 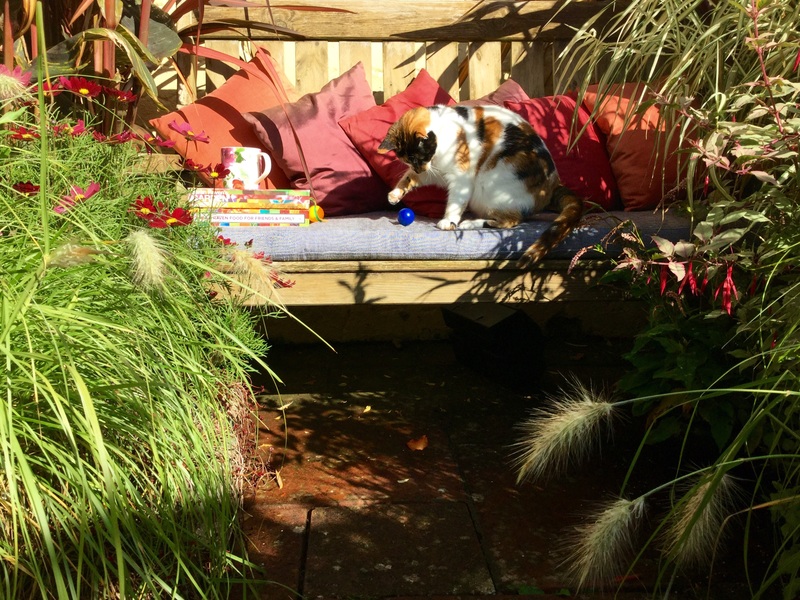 This is the area where we like to entertain on sunny high days and holidays, the cats magically appear whenever cushions are on offer. 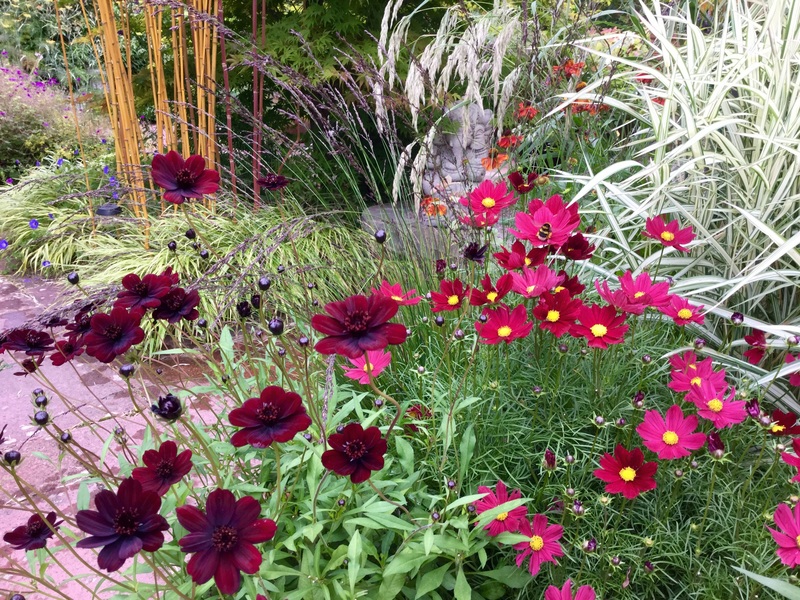 The rest are seasonal fillers, one of my favourites is the tender perennial Cosmos astrosanguineus for the way long stems lace through neighbouring flowers and foliage. This year’s flowers have been especially dark, almost black in bud. 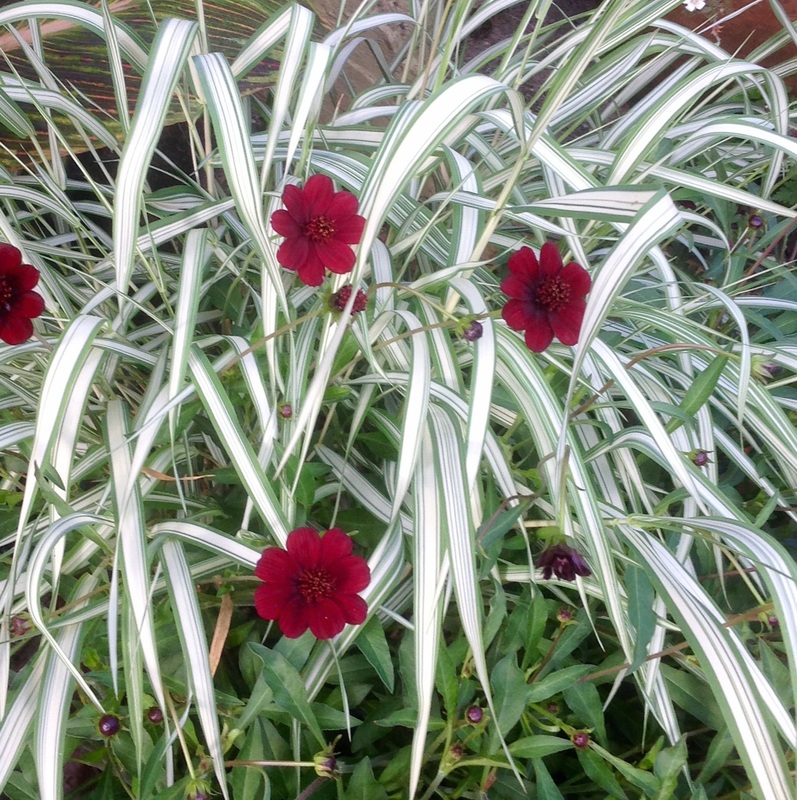 Last year a different batch of plants showed as a rich ruby colour. I have over wintered them in the greenhouse but they seem to take longer to flower and fill out. 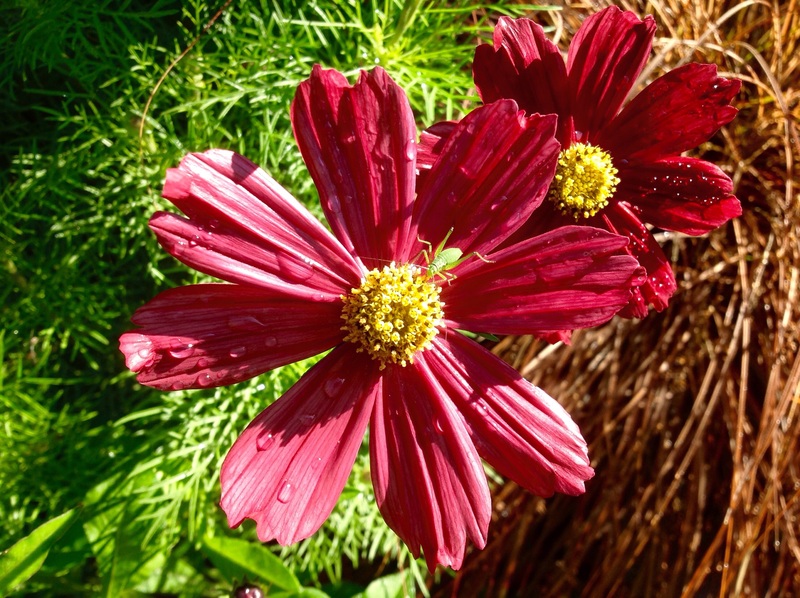 Every year there are variations, this year the first batch of half-hardy annual cerise pink cosmos was weaker than usual, by June quite a few plants had failed, I replaced them with unknown darker reds from the local garden centre. I like the way it fades from mahogany red through to a dusky pink, with shorter stems it’s been great in pots too. The closest match I can find is Sarah Raven’s description for Cosmos bipinnatus ‘Antiquity’, I’ll order a packet of seed to sow next spring. 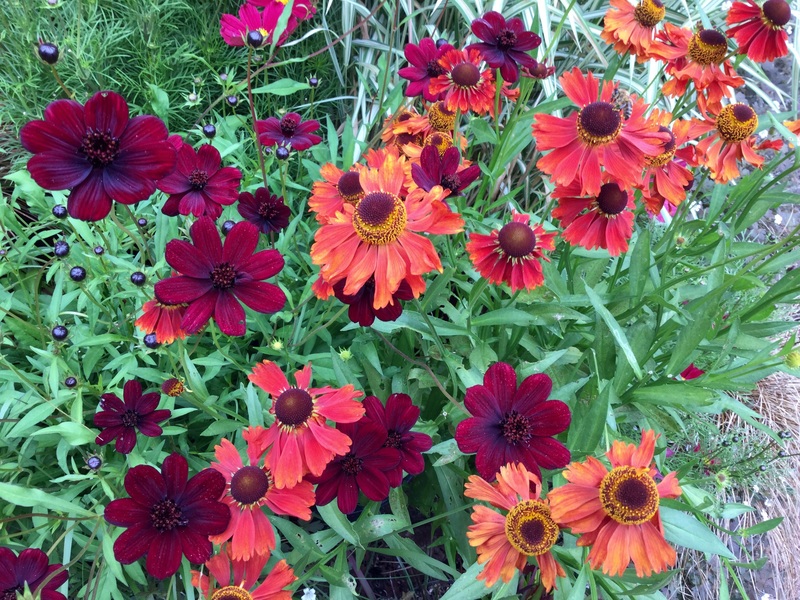 This year wanting orange earlier in the summer, several Helenium ‘Moorheim Beauty’ were added, they flowered well until September but despite being fed, watered and dead headed they seem to be grinding to a halt. As hardy perennials they’d be better planted in a border, leaving me looking for alternatives to augment next year’s display and a permanent home to keep the ‘sneezeweed’ happy. The mid storey is always trickiest to fill, in 2013 gingers lilies worked nicely for a season. However the dappled shade and sheltered spot near the green house suits them better, the handsome foliage scorched and looked less luxriant in direct sunshine. Now they are bursting out of 30 litre pots, although they’ll be ready to divide next May both flower better if slightly conjested. Like cannas theses are greedy, thirsty plants and keen to thrive. They would be hardy planted in the right spot, especially if given protection from winter wet. In their place, are yet more grasses and grass-like plants. Phalaris is great value for volume and presence from June onwards, fountains of toothpaste white offer contrast and drama. Wanton spreaders like this gardener’s garters often make fine pot specimens and are tough enough to tolerate neglect. Many of my container grown grasses have been growing in the same soil for many years, I’ve run out of enormous pots and I don’t want to keep dividing mature plants when they’re otherwise looking good. Last Friday I was reminded of a neat solution to this problem. Knoll Gardens won 10 Gold medals at Chelsea so it follows that Neil Lucas is a master at cultivating show stopping pot grown specimen grasses. 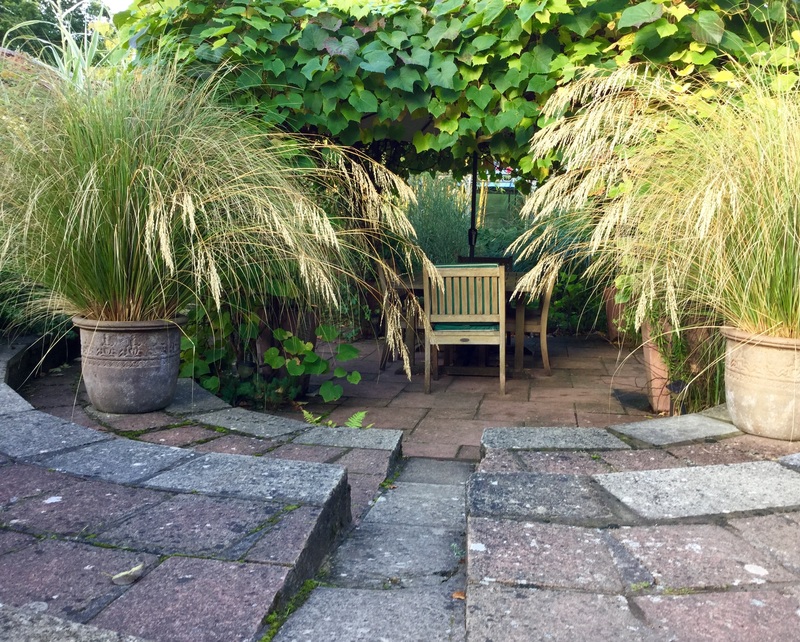 He shared many of his top tips at Friday’s local garden society talk ‘More Wow & less work : Grasses and their place in the garden’. What a great evening, I came away with the lots of inspiration plus two trays of Seslaria autumnalis plugs I’d ordered. Neil recommends reinvigorating a fibrous rooted specimen by slicing off a third of the root ball, then replenishing the soil. This should be done only when plants come into active growth, which varies depending on the type of grass in question. I’ll tackle the phalaris next spring. 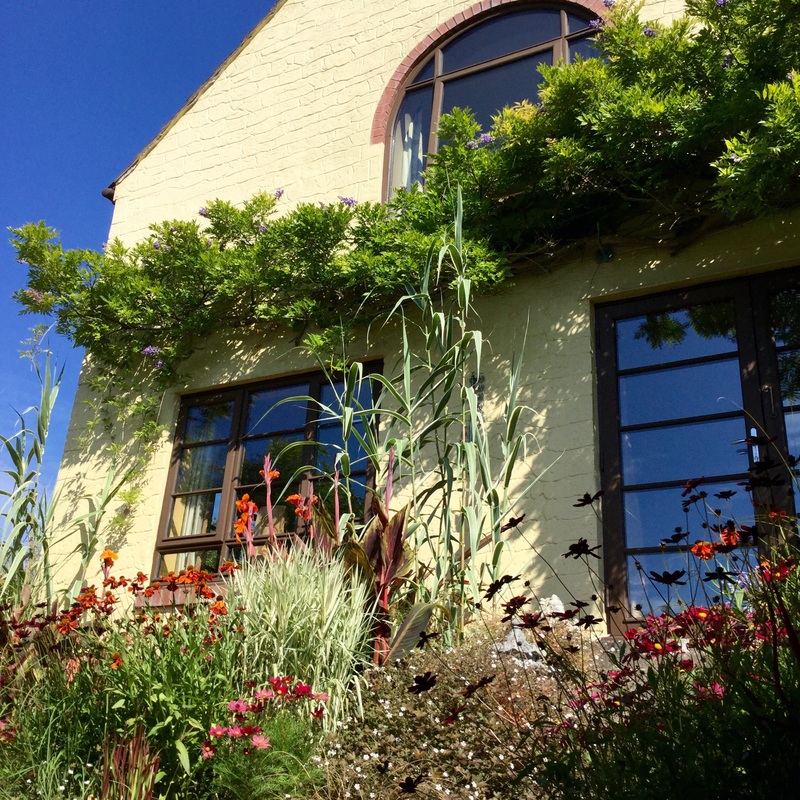 Two weeks ago the sun loving, borderline hardy Pennisetum villosum joined the party, first brought to full flowering point against the warmest west wall behind the house they are now positioned to catch the light and the eye. The results are a great improvement on its performance last year, especially the ones shaded by the pergola. Finally, this is where I keep an eye on special sundries. Quite often these are gifts from green fingered and thoughtful garden visitors, among this year’s treasures is a cutting of Salvia ‘Phyllis’ Fancy’ given to me by Helen Johnson aka The Patient Garden when she visited the garden in late August. A couple of weeks later, I enjoyed seeing Helen’s own hardy-exotic garden and meeting the stunning parent plant, she wrote about this salvia in last Saturday’s post My Garden This Weekend. 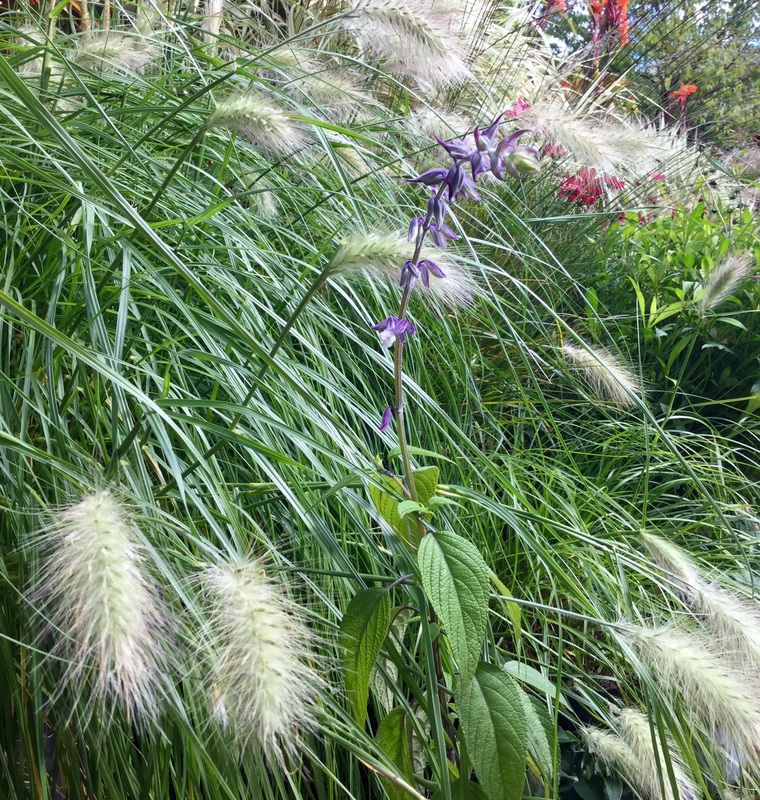 The grey green leaves with purple ribs blend beautifully with the Pennisetum …. Towards the end of October the foliage of the tender perennials becomes blackened by frost, this is the time to haul them back into the nearby frost free greenhouse. The cannas and ginger lilies are cut back to within a couple of inches of ground level, labelled to save confusion next May, and dried off through November. 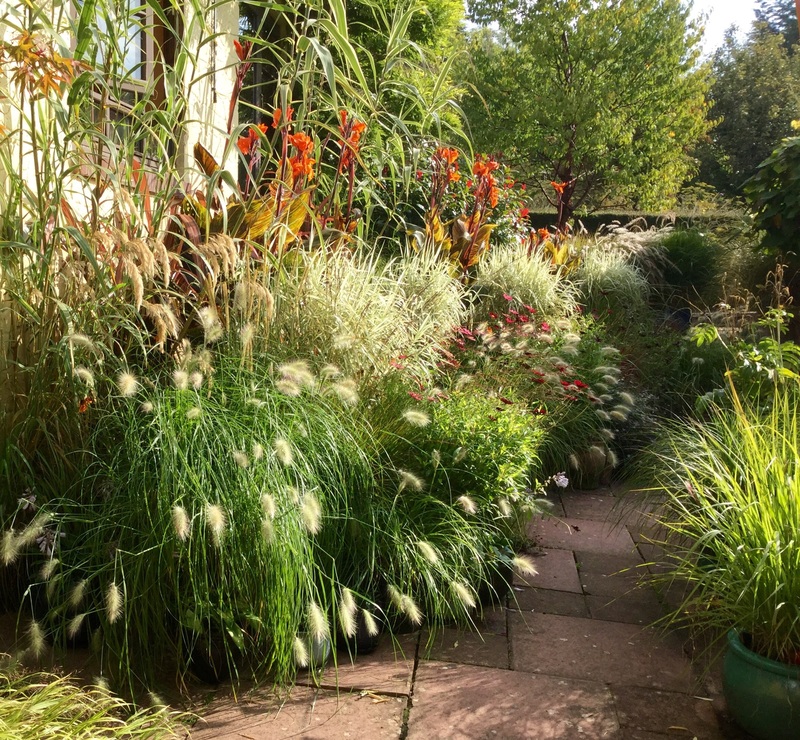 Joined by the large pots of Pennisetum villosum (that are left with top growth intact) there’s just enough room to squeeze in dreams for next year’s display alongside sentiment for times past. Divisions of my late grandmother’s Haworthia are still being passed around the family some thirty years since she grew it in her seaside conservatory. So many wonderful combinations Kate. They all look great and so healthy. Your pots are stunning. Would be interested to read more detail about these. As for the cuttings of your late grandmother, that’s what I hope to inspire my children to! I’m sure you’ll be an inspiring influence, the love of plants is such a wonderful gift. There’s a great source of info for true hardy exotics http://www.cooltropicalplants.com if that helps. Everything in the patio pots is very easy, the hardest part is getting huge pots in and out of the greenhouse. Cannas, Arundo and the ginger lilies are happy with damp feet so they sit in saucers, which helps. All get through lots of slow release fertiliser followed by liquid feed. I might come back to some of the hedychiums later, one or two of them have interesting autumn habits. Hi Kate, sorry for tardy response. I bet those large take pots are a job to move but it is obviously worth it given your displays. I have taken a look at the link, great thanks. Visited the Sussex Prairie Garden at the weekend, have you visited? (website of the same name) Think you would like it.D. By luck and not judgement, they’re not too far from the greenhouse! but yes, they’re heavy, a few tricks help a bit like filling the bottom third with light weight clay balls (hydroleca) it is lighter than loam based compost yet holds moisture and nutrients …. Glad the link is of interest, looks a good product. How funny, we visited SP this time last year, and yes, I did like it very much. Next year, I’d like to see it a bit earlier, maybe August for the full impact of colour, when we were there grasses, seed heads and late blooming prairie plants were fabulous. Great nursery too, did you buy anything nice as a souvenir? It sounds like I may need to move my ginger lily then. It is in the warmest border I have, right by the house wall but was getting shade from the big tree until we chopped the tree down. It now gets at least 3 hours more direct sunlight and has rewarded me with flower buds for the first time in 3 years, but I wonder if it will prove to be too much sun. Love the trick with slicing off the grass rootball. It’s great if your ginger has flowered, aren’t they fabulous? Maybe they take time to get going, especially in open ground, we only got a few the first year or two. The site sounds good, they like warmth and shelter – maybe morning sun is better than afternoon? Our garden is not sheltered, even the south gable wall is intermittently stripped by winds, perhaps that stresesd them the first year. The Arundo whirls round like vertical car wash brushes on stormy nights and has to be anchored to the wall. Fantastic pots. Mine are very shoddy in comparison. I’ve not tried grasses in pots before (except Carex), but having seen yours I am going to try some next year, especially Pennisetum I think. I love the ‘saw’ photo, it reminds me of using a tree pruner on the irises in the pond. I am curious about your thermometer …. how does it work? Yes, Neil’s tip & image is very useful! 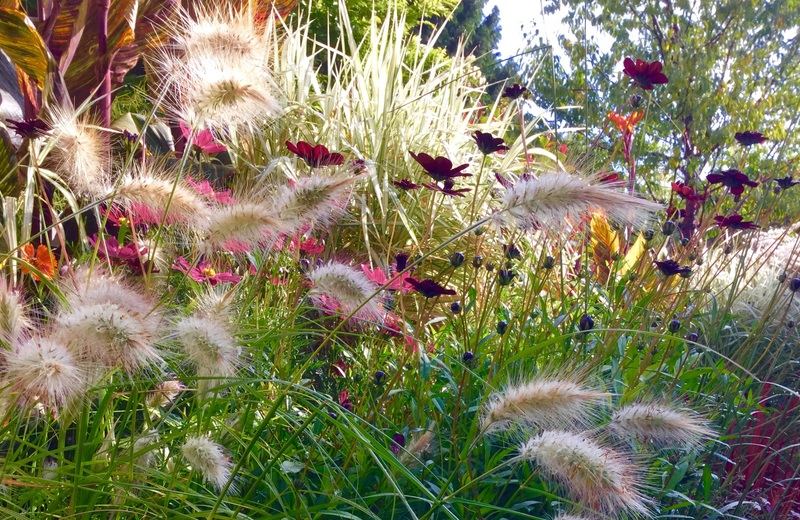 I did it to a Pennisetum villosum this year out of pure desperation, it seems to have done it the world of good. 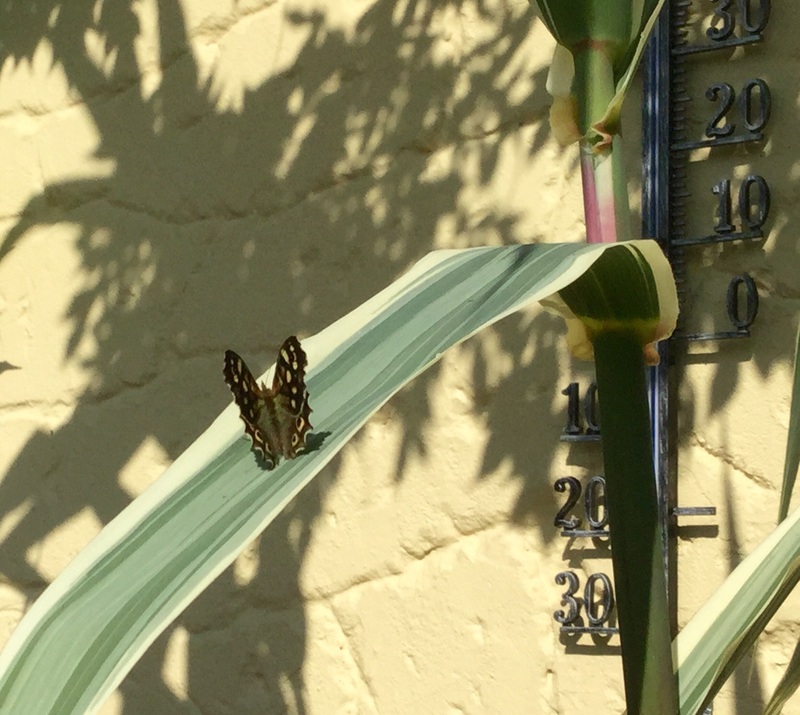 The thermometer has a blue gauge, seems to fluctuate within expected realms, gets very warm against this sunny, sheltered wall, often 30 in full sunshine which must help the more tender plants a bit. There are lots of good grasses for pots, dwarf forms of both molinia and miscanthus do well. The bigger the pot, the better ;) . Those first few photos in particular are stupendous, Kate – I look forward to being able to visit one day! I like the dark cosmos too and tried ‘Antiquity’ this year but found it disappointing. 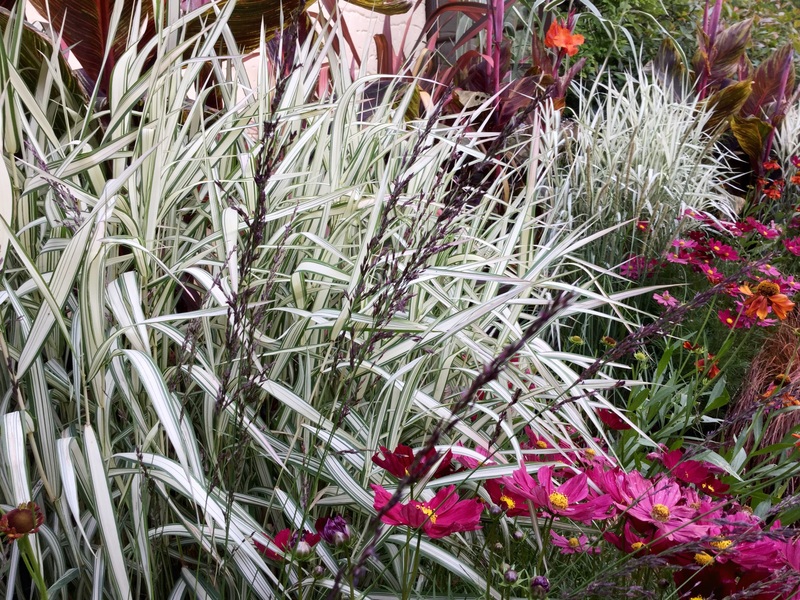 Do you move your less hardy grasses inside as a matter of course and is it worth the effort? I hope I’ll meet you too. 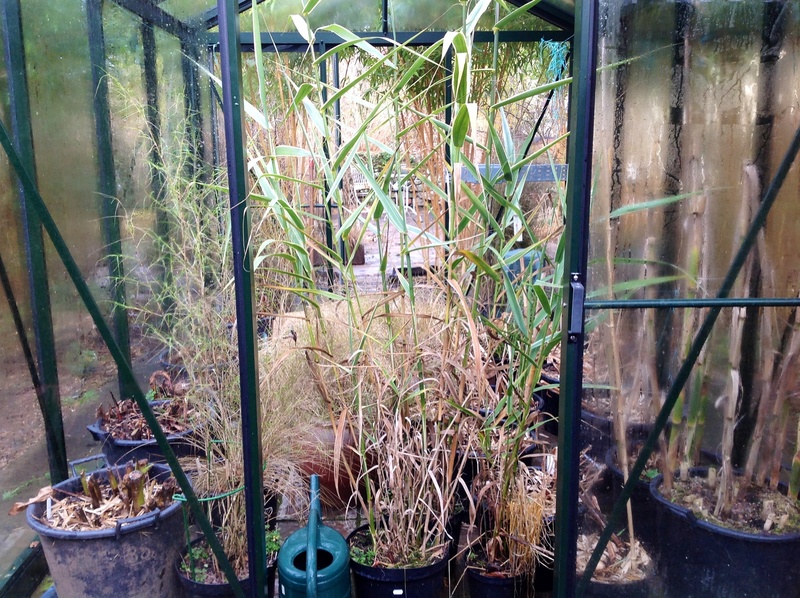 Only the Pennisetum villosum and variegated Arundo donax both of must be moved inside and kept frost free, all the other grasses in pots are fine and we’ve had occasional winter temps of -12C. The Arundo has always been a fabulous summer specimen, whereas this is the best year for the villosum in my garden. It’s done so well, I think it’s worth the fuss again next year, the flowers are so beautiful and tactile. It is ground grown in more southerly gardens, Wisley has an amazing planting of it. I can’t remember when I have ever seen such fabulous pots. I love how you have used do many grasses to anchor the displays. Your garden is looking amazing. I was interested to see you have the Mediterranean cane, it grows in damp spots all around here even where the water is from a mineral laden volcanic hot spring. They are unstoppable here do I don’t think I’ll be adding any here! Thanks, Christina, I enjoy the display, not least because it can be tweaked and added to as the months go by. Just as well, as sometimes things don’t work as I expect them to like the cosmos this year. It’s so interesting to hear how plants grow as natives, I didn’t know Arundo was robust enough to tolerate such harsh conditions. Perhaps it should be no surprise, reeds are used as natural ‘filters’ to clean grey water etc. I can see why you’d be wary of introducing arundo into your garden in Italy, it would be in its element. I agree with Christina. These pots are absolutely outstanding. 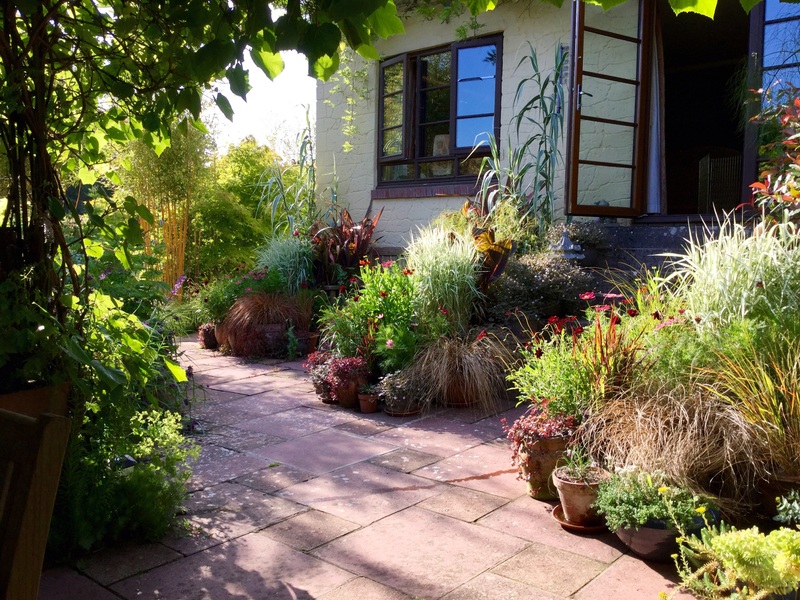 I love how you have used the grasses to pull the containers together and the combinations of colours are fantastic – soothing and punctuating at the same time, which is such a hard balance to achieve. I love them! Thank you Janna, I’m glad you like them. The cool whites of the Phalaris help tone the bright colours down, plus lately the creamy flowers of the Pennisetum – as a sun lover it’s really enjoying this spell of fine weather. Have you been basking in the sunshine too? Your posts are packed with so much interesting info Kate. Thank you. 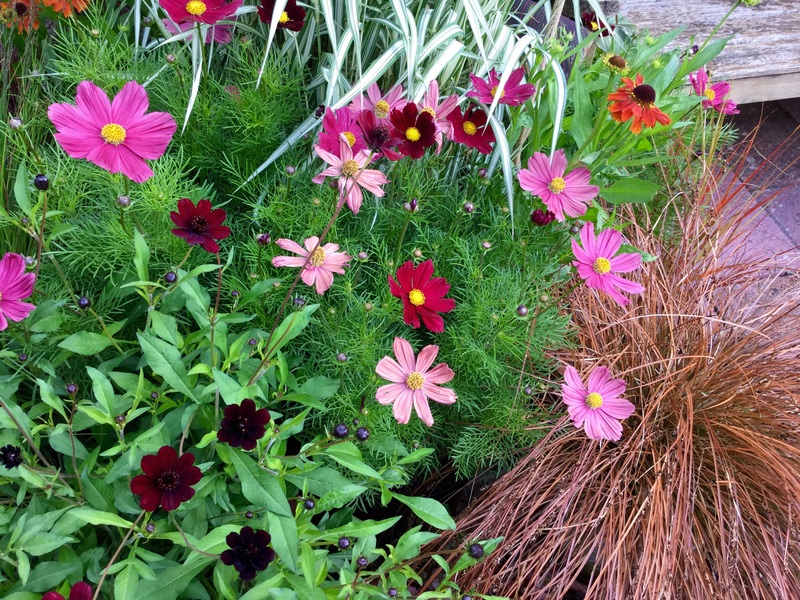 The chocolate cosmos looks great growing through gardener’s gaiters. I planted GG this in my first garden in 1985 and brought a clump here, sadly I don’t have it anymore, but it does show I’ve always been drawn to grasses! The Pennisetum I’ve long admired at Polesden Lacey is P. villosum. Yours looks fantastic. Sarah Raven’s Garden Cookbook has been my allotment produce recipe saviour for about 10 years now. It is falling apart and very stained, always the sign of a good cookbook I find! I love the look of C. Antiquity and I’ve made a note of the seed for next year. 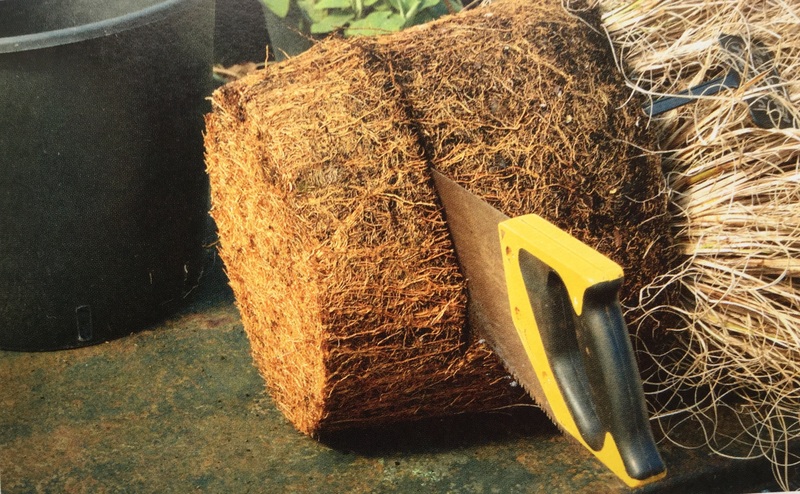 And as for the photo of sawing through the rhizome root of a mature grass, I wished I’d seen this about five years ago when I needed to divide a huge clump of miscanthus! I’ve got my mother’s agave which I’m sure she brought back from Majorca in 1972. I split it into three and gave one each to my brothers. Great post! Neil Lucas’ book is full of lots handy tips ;) . Dividing a fully mature miscanthus can be hard work, especially if the centre is woody – I don’t think it’s worth keeping those bits (I think the edges grow to make better plants) but my husband always rescues the discards and pits them up anyway. thinking of trying this method with some box balls, I wonder if it will work as well? 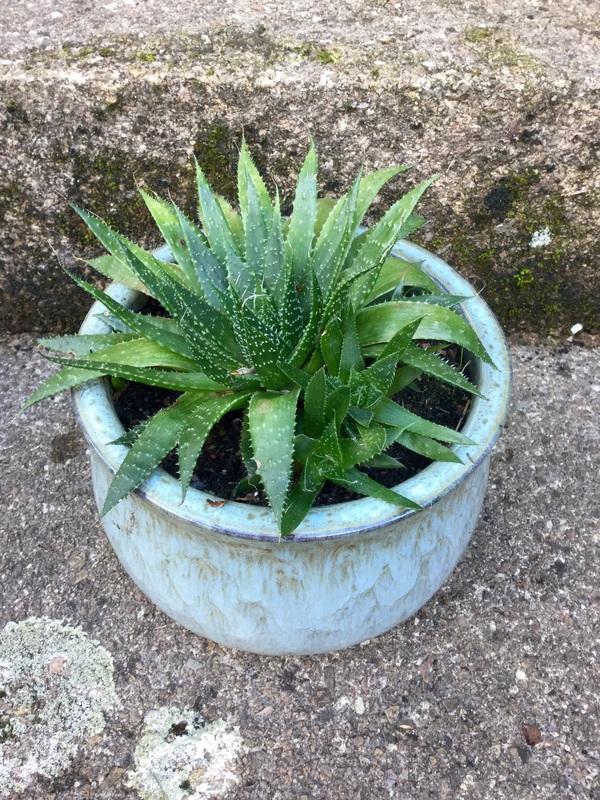 It’s wonderful that you still have your mother’s agave, plants can be such special reminders of people we love or of friendship. Wow! Amazing pots Kate. Absolutely fabulous and great tips too. Another wonderful post. I grow the variegated Arundo donax in the garden. I know it’ s not supposed to be hardy but mine is. I’m very interested and so impressed to hear that your variegated Arundo donax is hardy in your garden, it must look amazing as a mature ground grown stand. Does it flower too? Perhaps I shouldn’t be surprised if the answer is ‘yes’ you have such green fingers and a very special garden.